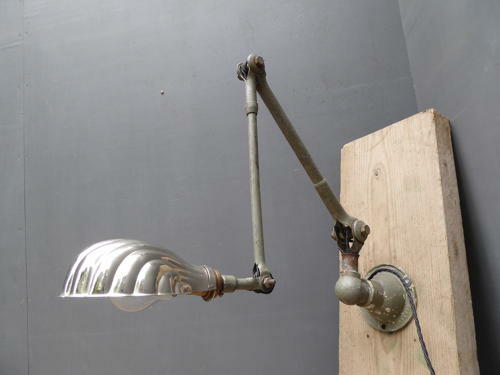 A good early example of a vintage industrial Dugdills wall lamp. A beautiful lamp in a wonderful coat of old paint with a cracking patina, retaining its original chrome clam shell shade & chunky cast base. An absolute classic with a wonderful overall look about it, rewired in twisted black flex. Wear commensurate with age, overall good original condition. The lamp shows numerous pleasing signs of age & has a very old repair to the metal near the base which does not detract (I did not even notice this until taking the photographs, blends effortlessly with the rest of the lamp, see close up). Measurement given(105cm) is a flat out measurement & overall reach depends on position. Electrical items should be checked by a qualified electrician prior to use.